Eating a solid breakfast meal is a great way to start your day right. And yet so many people are meal skippers in the morning! Studies have shown that if you're serious about losing weight the healthy way, you'll want to also get serious about eating better breakfast meals. 1. Plan ahead. The morning rush doesn't leave much time for cutting up fruit or slow cooking your oatmeal. That's why we recommend doing some simple breakfast preparations ahead of time, either the night before or even on the weekends. Examples include washing and slicing those strawberries, stewing some prunes, making a nice-sized container of oatmeal that can be heated in minutes in the microwave or even hard boiling some eggs. The minutes spent doing these advance preparation tips will save you time and ensure you'll have more time for your most important meal of the day. 2. Don't hit the snooze button. Sleeping late means you'll barely have time to fuel yourself with a healthy breakfast meal. So instead I recommend that you set the alarm 15 minutes earlier so you can take the time you need to eat and enjoy. This may also mean you'll need to get in bed a bit earlier the night before. When you're more rested, you'll be more likely to make those good diet choices from the start to the end of your day. 3. Find your inner child. A cold cereal breakfast is not just for kids. Cold cereal is probably the easiest and quickest breakfast meal you can prepare in minutes and eat on the run. Just add nonfat milk along with cut up fruit and be sure to choose a cereal that is calorie controlled, moderate or high in fiber and not loaded with simple sugars. Fiber One, Kashi and Barbara's cereals are some of the brands you may want to check out. 4. Think outside the box. If a breakfast rut is making you feel ho-hum about breakfast, it may be time to check out some new recipes. 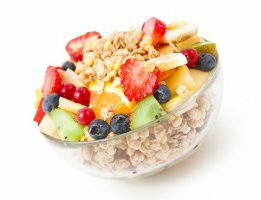 Consider making a yogurt parfait with nuts, fruit and high fiber cereal, a breakfast wrap made with a high fiber tortilla, scrambled eggs and salsa, topping your toasted whole grain English muffin with peanut butter and sliced bananas or topping frozen whole grain waffles with pecans and a drizzle of syrup. For more breakfast meal ideas, reach out to the Diet.com registered dietitian or check out the Diet.com Recipes.